corporate and non-profit (meetings, retreats, gala, fundraisers, luncheons, etc. Whatever the occasion may be, we have a plan! I am very excited to present you with information on making your event memorable and successful. For information about Crys Don Group and services email me at crys@crysdongroup.com. Don't forget to visit our website www.crysdongroup.com. Stay tuned for "Tips and Trends"
The time has finally come, and you're ready to take that next step...meeting the parents and even more meeting the family. With all the stress, excitement, appointments, payments, and checklist that come along with your wedding planning; how could you forget that the families need to meet? Many people are stressed at the thought of two families meeting at the wedding, so it is best to establish an informal and fun way for them to meet before the occasion. Here are two ideas to get them together and have a little fun while doing it. 1. Have a luncheon. Most families enjoy gathering around the table to laugh and talking about the past (which may be embarrassing to you, but they mean well), share pictures, and their most memorable moment with you. 2. Invite them to an overnight trip. Ok ok...I know you think I am crazy, but in most cases people accept offers to an overnight trip to escape the worries that they are having back home. Therefore they will make sure this short getaway is as stress-free as possible. In preparation for this trip bring games that require team effort or for them to work in pairs. After months of planning and looking forward to your wedding day, it is only natural to feel a little sad and flat once it is over. Usually, the sombre notes are short lived as the pleasure and joy of being married takes hold and you begin to look forward to a brand-new phase of life together. Unfortunately, for some, the transition from being single to married is not nearly so smooth. Today 1 in 10 brides fall prey to a condition known as Post-Nuptial Depression, which makes sufferers feel desperately low, aimless and disconnected from their newly married state. To them, life after the wedding seems mundane and meaningless with nothing to look forward to and it can be a struggle to even get out of bed. In severe cases the black cloud can linger for up to six months making for a miserable start to married life. The good news is that you don’t have to leave it to fate. You can make sure that you don’t become a candidate for the Post Wedding Blues by following these top ten tips. 1. Adopt a healthy and helpful perspective. First and foremost your wedding is about the ceremony that officially unites you as a couple and commemorates this landmark in your life. Everything else is secondary to that. 2. Create balance. Wedding planning can be fantastic fun but not when it becomes an obsession. Plan your day and prepare yourself in equal measure. Open your heart and mind to all the changes that you face. 3. Broaden your focus. Living only for your wedding day means you face a dramatic loss when it has passed. The months before you marry and the first 12 months after are significant and special too. Cherish and celebrate the entire experience. 4. Tune into yourself. Allocate regular, private relaxation time to honestly acknowledge your thoughts and emotions and release anything that feels uncomfortable or negative. Write it down, share it and discuss it- anything but suppress it. Your courage now will reward you richly later. 5. Get some clarity. Ensure that you are absolutely clear about what you are doing, why you are doing it and what it means to you, and identify your intentions for getting married. Deep contemplation is calming and a clear mind brings inner confidence. 6. Release your single identity. Getting married is a major life transition and in order that you can complete it successfully, you need to be prepared to let go of your single life and single way of being so that you can happily embrace your new married status. 7. Go through the process. You face a phase ‘in limbo’, when you are no longer single but not yet married, which can throw you. You may feel unsure, lost, confused-it’s just part of the Rite of Passage. Acknowledge it-let it happen. Fighting it only magnifies the feelings that sit within you to return at a later date. 8. Allow for a period of adjustment. Feeling married and behaving married takes time. It is an attitude, a way of being that grows and develops. Take the pressure off yourselves and look forward to getting into the groove of being married at your own pace during the first twelve months. 9. Arrange things to look forward to. Your first year of marriage is special so make it memorable. Hold post wedding dinner parties for friends and family and look at photographs/filming together. Book some short trips away and spoil yourselves as a couple to help you come down gently from the high of your wedding. 10. Live in the moment. Let your wedding day be something to look forward to but steer clear of a fixated countdown. Instead, practise being in the present and get the most out of all that is happening around you so when your day comes, you will know how to experience it in real time and savour every minute. And when it’s over, you won’t be afraid to let it go, because you know that life’s magic only happens in the here and now. The action, the drama, the passion and love can only exist in the present moment, and if your mind is elsewhere, you’ll miss it! Yayyyy! 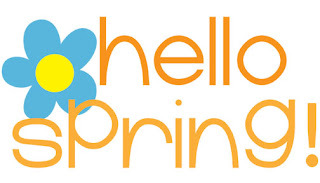 Spring is finally here. 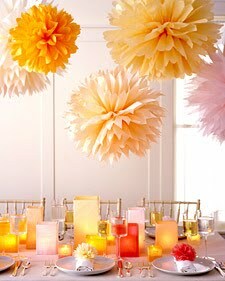 Flowers aren't the only thing blooming, so are ideas and creativity for your next event. Let's talk about bridal and baby showers...hmmmm. By now we are all tired of the same concepts...you know the diaper cakes, baby bingo, tea sandwiches, etc. We want style, color, chic, and memorable moments to shine through this occasion. Here are a few ideas to give you a more vibrant feel thats also "pocket-friendly". 1. Center Pieces- The main focal point of guest at the table is the center piece. For a bridal shower you do not want the table to be overwhelmed with design that your guest have no room for their plate. The center piece above is beautiful, simple and made with items that could be found in most households. 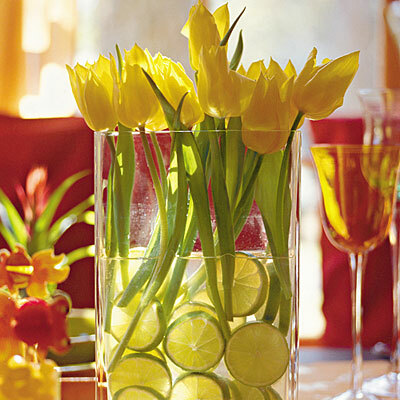 Made with fresh flowers, slices of lime, water and a clear vase, this decor would cost about $4-$5 each. This is a fresh idea for hosting event outdoors and in sun rooms. Porter House Designs gets two thumbs up for this refreshing piece. 2. The Sweet Adventures of Sugar Belle has blown me away with this idea. What better way to celebrate the life of the bride-to-be than with edible nail polish! This is a unique and chic party favor that could be used for all sorts of bridal showers, bachelorette parties, birthday parties, or just a girls night out treat. Another tasty favorite is CAKE. Now this is not a wedding, therefore a 3-tier cake is not necessary (unless that just something you really want). Art Eats Bakery has mastered a way to celebrate the mommy-to-be as well as the buddle of joy with this super cute "sundress preggo" cake. Invitations and Save the Date: When going green, make sure the invitations are made with recycled paper and envelopes. Twisted Limb Paperworks, is an paper design distributed that is dedicated to producing eco-friendly paper products. All of their products are handmade with 100% recycled paper. Twisted Limb gives you the choice of full service printing and assembly or easy do-it-yourself (DIY) invitations. Venue: Eco-friendly venues...does that exist? Of course it does. Places such as museums, aquariums, botanical gardens, and organic farmland are great places to host weddings. There are also green hotels that offer activities and services for the greater good. How many weddings have you attended where there was a massive amount of leftover food? Green hotels will donate all leftover food to shelters...how cool is that! Another great location is beach or lakeside weddings. The natural beauty of this scenery is breath-taking and easy on the pockets, since you won't need much decor. Favors: Memories, memories, memories. You always want you occasion to e as memorable to your guest as it was to you. In today's trends, wedding favors range from candy buffets to scented candles, all of which could also serve its purpose as you go green. Little Things Favors has 75 wedding favors for you to choose from. Whether you want soothing gifts such as the beeswax candles or planted memories of the magic bean, Little Things Favors has it all. Whatever the occasion may be, we have a plan! I am very excited to present you with information on making your event memorable and successful. For information about Crys Don Group and services email me at crys@crysdongroup.com. Stay tuned for "Tips and Trends"